Microsoft integrated the functionality in the Windows 8 operating system and kept it activated on Windows 10 devices. The biggest complaints that Windows users have about it are that it is displayed in a fixed position and that it cannot be disabled. The fixed position of the volume display means that it may be displayed on top of controls or information on the screen. There is little that you can do about this because you cannot modify the position of the display nor change the duration the volume popup is displayed. 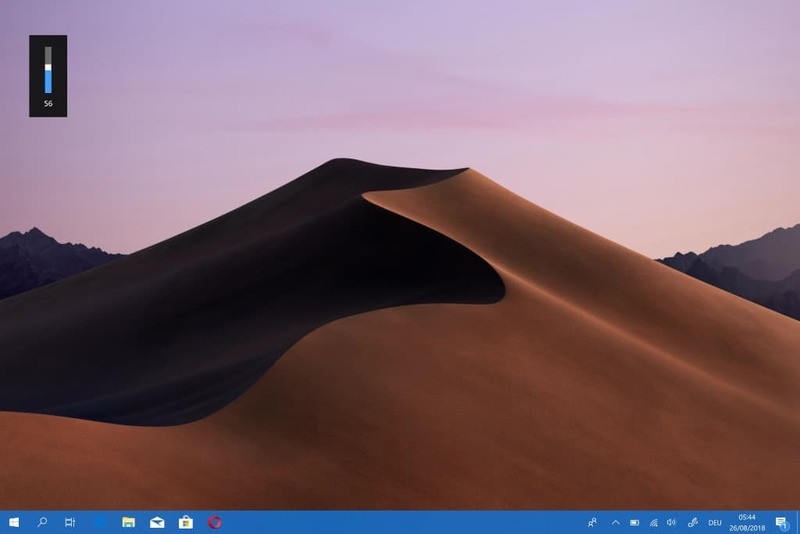 HideVolumeOSD is a free program for devices running Microsoft's Windows 10 operating system that hides the on-screen volume indicator on devices running Windows 10. Tray icon version -- Displays a tray icon which you can activate to toggle the on-screen display functionality. Silent mode version -- No tray icon and no option to toggle the functionality. In other words, OSD is hidden all the time. HideVolumeOSD adds three launch icons to the program group in the Start Menu. You may use it to launch the system tray or silent version of the application, and to switch the silent version from hidding the volume OSD to displaying it. If you don't find the volume OSD useful on Windows 10 devices, for instance when you use another program that displays a volume indicator, then you may find HideVolumeOSD useful as it hides the on-screen display on the operating system.